Former President of Guinea Bissau. He was assassinated on March 2, 2009 by the army. After President Kumba Yalá was overthrown in September 2003 military coup, Vieira returned to Bissau from Portugal on 7 April 2005. Arriving in the city's main football stadium by helicopter, he was met by over 5,000 cheering supporters. Although Vieira's supporters had collected 30,000 signatures for a petition urging him to run for president, he did not immediately confirm his intention to do so, saying that he was returning "to re-establish [his] civic rights and to register to vote in the coming elections" and that he wanted to contribute to peace and stability. He also said that he had forgiven his enemies and that he hoped others would forgive him for any harm he had caused. On 16 April, it was announced that he intended to stand as a candidate in the June 2005 presidential election. Although many considered Vieira to be ineligible because he had been living in exile and because of legal charges against him pertaining to the 1985 killings of suspected coup plotters, he was cleared to stand in the election by the Supreme Court in May 2005, along with Yalá. The Court unanimously ruled in favor of his candidacy on the grounds that he had already ended his exile by returning in April and that no court records of the murder charges could be found. His old party, the PAIGC, backed former interim president Malam Bacai Sanhá as its candidate. According to official results, Vieira placed second in the 19 June election with 28.87% of the vote, behind Malam Bacai Sanhá, and thus participated in the second round run-off. He officially defeated Sanhá in the run-off on 24 July with 52.45% of the vote and was sworn in as President on 1 October. On 28 October 2005, Vieira announced the dissolution of the government headed by his rival Prime Minister Carlos Gomes Junior, citing the need to maintain stability; on 2 November he appointed his political ally Aristides Gomes to the position. In March 2007, PAIGC formed a three-party alliance with the Party for Social Renewal (PRS) and the United Social Democratic Party (PUSD), and the three parties sought to form a new government. 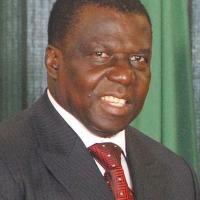 This led to a successful no-confidence vote against Aristides Gomes and his resignation late in the month; on 9 April, the choice of the three parties for the position of Prime Minister, Martinho Ndafa Kabi, was appointed as Prime Minister by Vieira. In Kabi's three-party government, Interior Minister Baciro Da Later, after PAIGC withdrew from the three-party alliance to protest Kabi's actions, Vieira dissolved the National People's Assembly and appointed Carlos Correia to replace Kabi as Prime Minister on 5 August 2008. Rebellious soldiers attacked Vieira's home in the early hours of 23 November 2008, shortly after the November 2008 parliamentary election, in which PAIGC won a majority of seats. The soldiers fired artillery at the house and were able to enter it during a three-hour battle with Vieira's guards, but they were repelled before they could reach Vieira, who was unharmed. At least one of Vieira's guards was killed, and others were injured. Vieira held a press conference later in the day, in which he said that the attack had "a single objective – to physically liquidate me", while also asserting that "the situation is under control"
He was the President of Guinea-Bissau from 1980 to 1999 and again from 2005 to 2009. After seizing power in 1980, Vieira ruled for 19 years, and he won a multiparty presidential election in 1994. He was ousted at the end of the 1998–1999 civil war and went into exile. He made a political comeback in 2005, winning that year's presidential election. Vieira was killed by soldiers on 2 March 2009, apparently in retaliation for a bomb blast that killed Guinea-Bissau's military chief General Batista Tagme Na Waie. The military officially denied these allegations after Army officials claimed responsibility for Vieira's death.